A grand tour of some of the most iconic parts of Scotland and the Borders Country! A grand tour of some of the most iconic parts of Scotland and the Borders Country, staying in Melrose, the resting place of the heart of Robert the Bruce. Visit haunting abbeys, picturesque border towns with fascinating and blood stained histories. 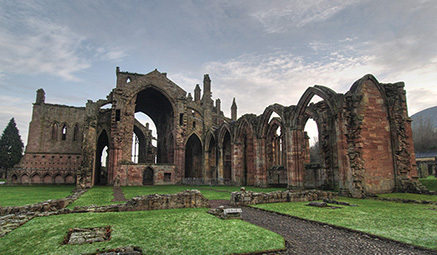 Ancient Abbeys - Full Day - first we’ll venture into St Boswells, where the haunting Dryburgh Abbey sits. We’ll then head to Jedburgh, with its breathtaking Abbey, wander this award-winning town. Finally we’ll head to the beautiful market town of Kelso. Berwick-upon-Tweed - Full Day - to this dramatic walled town snuggled up to the beautiful River Tweed. 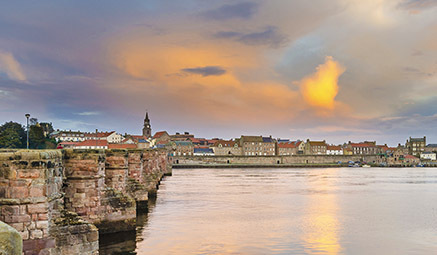 The most northerly town in the whole of England, Berwick-upon-Tweed is full of rich history and founded as an ancient Anglo-Saxon settlement. With a thriving community of artists, the town inspired Lancashire painter L.S. Lowry and many artists since have followed, struck by its stunning views and rich history. A charming and eclectic Georgian market town with a huge range of things to do and see. Outward - via main roads and motorways, arriving in Melrose mid/late afternoon with time to wander around this historic town before dinner at the hotel. Return - via the border town of Peebles, with time to explore, before heading for home dropping off early evening.